Another annual Independence Day has passed, with wide-ranging celebrations by individuals, families, friends, and communities. Although extravagant firework displays continue as featured July 4th events throughout this grand country, one wonders how sustainable these expensive noise-and-air polluting public events will be in future years. Along with such patriotic celebrations as Memorial Day, the celebration of Independence Day conjures conflicting thoughts and feelings associated with either nationalism or patriotism, both of which indicate the types of relationships individuals have with their native country. It seems fair to say that most people tend to express both nationalism and patriotism, depending on the circumstances and context of a given situation. Although the two terms are frequently misunderstood and used interchangeably, there are some differences. In simple terms, nationalism is associated with those who share a unified socio-cultural background, including language, heritage, and, frequently, religion. Nationalism is generally associated with isolationism, authoritarianism (top-down rule), the undying loyalty of citizens, and militarism. According to British author-journalist George Orwell, nationalism “is the worst enemy of peace”. The nationalist motto might be “My country, right or wrong”. WWII Japan and Nazi Germany represented model nationalistic states, with profoundly held beliefs in the superiority of their respective cultures and heritages. As an isolated island nation, the Japanese were long united by their highly homogeneous genetic heritage. Meanwhile, the Nazis infamous solution to create a homogeneous Aryan race was to exterminate the Jewish population throughout Europe. In contrast to nationalism, patriotism is more closely associated with the deep love and devotion individuals have for their country, with a greater emphasis on shared values and beliefs. 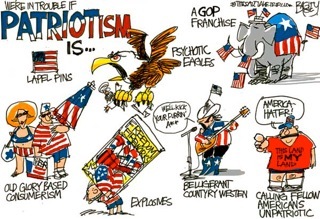 Patriotism is typically associated with a value system that encompasses such qualities as individual freedom, reason and critical thinking, democracy (bottom-up rule), human equality, economic opportunity, and peaceful coexistence with other nations. There are several highly developed democratic countries that serve as models of thriving patriotism, including the U.S. But when considering peaceful coexistence with other countries as a hallmark of true patriotism, the Scandinavian countries seem to score higher. To some countries, the U.S. is viewed positively, as a protector, while others view us negatively, as belligerent imperialists. So how do nationalism and patriotism relate to sustainability concerns? Well, for me, a true patriot’s deep love of country extends to the entire planet, inspired with the motivation to seek and develop a sustainable, high-quality existence for all life forms. In a world beset with a series of severe converging crises, militant nationalism has no place. Humanity’s salvation will depend on how well we learn to live peacefully and cooperatively with others, as we strive to create healthy, balanced ecosystems and communities that provide essential resources for sustaining life—for all of Earth’s creatures. > The Archdruid Report: The Dream Of The Machine (John Michael Greer). People in Western Europe and a few of its colonies dreamed of machines, and then created them. They dreamed of a universe reduced to the status of a machine, a universe made totally transparent to the human mind and totally subservient to the human will, and then set out to create it. That latter attempt hasn’t worked out so well, for a variety of reasons, and the rising tide of disasters sketched out in the first part of this week’s post unfold in large part from the failure of that misbegotten dream. > Resilience: Review: Love In The Age Of Ecological Apocalypse By Carolyn Baker (Frank Kaminski). Baker believes we’re approaching a rite of passage that will reveal to us our true place in nature, and perhaps even transform us into a new breed of human being. The “Enlightenment Enculturation” that has tricked us into thinking we’re separate from nature, by emphasizing logic over intuition and objectifying living systems as “resources,” will give way to a truly enlightened perspective, an outlook common to beliefs of indigenous cultures that view all living beings as connected. > Climate Progress: Climate Change Could Cause More Than $40 Billion In Damage To National Parks (Annie Wang). An National Park Service report, released in time for the two-year anniversary of the announcement of President Obama’s Climate Action Plan, examines the effects of a sea level rise on 40 coastal national parks across the United States. finding that over 39 percent of the 10,000 assets (historic sites, infrastructure, museum collections, and other cultural resources) were categorized as “high-exposure” to sea-level rise caused by climate change. > Climate Progress: The West Is Literally On Fire, And The Impacts Could Be Widespread (Natasha Geiling). As of June 30, 45 wildfires large active wildfires burned from Alaska down to Arizona and as far west as Colorado. Fighting wildfires also comes with a large price tag, with an average of $1.13 billion spent on wildfire suppression each year. With climate change, that price could increase to $62.5 billion annually by 2050. But wildfires impact more than just forests and the economy — they can have far-reaching impacts on public health, water quality, and climate change. > Climate & Capitalism: Will Climate Chaos Reign In The Anthropocene? (Ian Angus). This year, atmospheric carbon dioxide rose to 403 parts per million, compared to a maximum of 280 during the wildest climate swings of the Pleistocene. That’s much more than a small nudge, so no one should be surprised if the ornery beast strikes back violently, again and again. And no one should be surprised if the result is a world unlike anything humanity has ever seen. To prevent that, or at least minimize its effects, the first thing we need to do is to stop poking the beast. > Minnpost: Large, Early Blazes In Unusual Places Are Shaping This Year’s Wildfire Season (Ron Meador). The geographical pattern of this year’s wildfire pattern is unusual but not unexpected. In testimony before Congress in early May, U.S. Forest Service chief Tom Tidwell said the entire north-central portion of the United States was facing above-normal patterns of wildfire this year. > Sustainable Food Trust: Agriculture Beyond Water (Megan Perry). Drought is becoming more prevalent and causing havoc for food producers around the globe. Many regions have been hit by severe water scarcity over the past few years and this trend seems set to continue. > ASPO USA: Peak Oil Review – 29 Jun 2015 (Tom Whipple). Midweek update. Despite a rally on Tuesday, New York oil futures closed on Wednesday at $56.69 a barrel, the lowest level since mid-April. > Climate News Network: Renewable Energy Redoubles Its Global Reach (Alex Kirby). A significant threshold has been crossed by renewable energy, as analysts report that the sectorʼs size last year reached double the level it was at just 10 years earlier. This expansion happened in a year when the global economy and energy use both grew, but without a matching rise in emissions of carbon dioxide − the greenhouse gas targeted in efforts to restrain global warming. > Oil Price: The Coming Financial Apocalypse For U.S. Shale (Gaurav Agnihotri). The oil industry is at a crossroads. Many oil companies will continue to suffer if oil prices remain low, and rising debt could lead to more defaults. Some bullish analysts expect oil prices to increase towards the end of this year. That might be the only thing that rescues a lot of companies from drowning in red ink. > Eco Watch: Citizens Can Sue Fracking Companies For Earthquake Damage, Says Oklahoma Supreme Court (Anastasia Pantsios). Earthquakes are a rarity in Oklahoma, but in the last six years they’ve increased so much that last year the state surged past California as the most seismically active state in the continental U.S. Prior to 2009, the state averaged two quakes of greater than 3.0 magnitude annually. By 2014 that number had soared to 585, up from 109 in 2013. Scientists are convinced it’s the wastewater injection wells that have accompanied the explosion of fracking in that state. > Resource Crisis: The Limits To Growth And Greece: Systemic Or Financial Collapse? (Ugo Bardi). But, could it be the financial circus that we are seeing dancing in and around Greece be just the effect of much deeper causes? The effect of something that gnaws at the very foundations not only of Greece, but of the whole Western World? > Business Insider: China’s Stock Market Is Crashing, And The Chinese Are Trying To Do The Exact Same Thing America Did In 1929 (Oscar Williams-Grut). In addition to Greece’s financial problems, China is having a serious market meltdown. After exploding earlier in the year because of deregulation, China’s benchmark Shanghai Composite has collapsed a crazy 29% since the highs of early June. China’s other stock markets have had similarly steep falls. Bloomberg notes that the crisis is closely mirroring the 1929 Wall Street crash, which led to the 1930s’ Great Depression in the US. > Peak Prosperity: In A World Of Artificial Liquidity – Cash Is King (Nomi Prins). Before Greece tried to stand up to the Troika, global central banks were merely worried. Now it’s clear that no matter what they say about the necessity or even righteousness of their monetary policies, liquidity can still disappear in an instant. A big problem is that central banks have no plan B in the event of a massive liquidity event. The ‘war on cash’ is really a war on the difference between the money you can hold on to and the money the banks can take away from you. > Zero Hedge: Who Will Be The Last To Crash? (Tyler Durden). US debt is north of $18 trillion. Forward promises are north of $200 trillion, meaning that a child born today is responsible to repay $625,000. And since roughly half the US population pays no income tax… and presuming that this newborn will be a member of the productive half… he or she is born $1.25 million in debt. Such repayments will never happen. Most of those debts will not be repaid. > Resilience: Here’s What A Commons-Based Economy Looks Like (David Bollier). Michel Bauwens of the P2P Foundation offers a remarkably thoughtful and detailed explanation in a just-released YouTube talk, produced by FutureSharp. Michel focuses on the importance of three specific realms that are crucial to this new vision – ecological sustainability, open knowledge and social solidarity. Each is critical as a field of action for overturning the existing logic of market capitalism. > Grassroots Economic Organizing: What Does Community Mean? (Sky Blue). People want more community because contemporary life in mainstream America (in particular; it’s certainly not limited here) is incredibly dissatisfying for most people. When people get more satisfaction from their interpersonal relationships they seek consumption and entertainment less. This has both an ecological and a financial benefit. It’s cheaper and wastes less resources. > CASSE-The Daly News: Good Health Requires Different Economics (Dr. Trevor Hancock). The “ecological determinants of health come from the Earth’s natural ecosystems, and they are threatened by the massive and still growing human-induced global ecological changes now underway. Wealthy countries need to shift focus from the pursuit of economic development to the pursuit of a higher goal: human development that is equitable and sustainable. See: Discussion Paper and a technical report on global change and public health. > RSA Animate: Changing Education Paradigms (Sir Ken Robinson). This very informative 12-minute animation is adapted from a talk given by Dr. Robinson on divergent thinking, an intellectual process he finds lacking in most current educational programs, which are based mostly on the Industrial Revolution factory-line paradigm. > Peak Moment TV: Grow Your Food In A Nook And Cranny Garden, Part 1 (289) (Robin Mallgren). A tour of Gord and Ann Baird’s edible landscape starts at the off-grid chicken house and yard, containing fruit trees that provide a protective canopy against flying predators. Roof rainwater becomes drinking water for the chickens, whose “rototilling” has prepared land now being planted in grains. Also see: Grow Your Food In A Nook And Cranny Garden, Part 2 (290) “We’re here to help form things. We have a food forest mimicking what the natural forest does.” Ann and Gord Baird’s edible gardens make use of less-than-ideal growing spaces on their rocky knoll. > Center for Biological Diversity: Settlement: EPA To Analyze Impacts Of World’s Two Most Widely Used Pesticides On 1,500 Endangered Species (Brett Hartl). The EPA will also analyze the impacts of propazine and simazine, two pesticides that are chemically similar to atrazine. It has committed to completing the assessments by June 2020. Up to 80 million pounds of atrazine are used in the United States each year. In addition to causing severe harm to endangered species, atrazine exposure may be linked to increased risks of thyroid cancer, reproductive harm and birth defects in people, Glyphosate (Monsanto’s Roundup) will also be studied.